A timeless oasis for your face and skin! 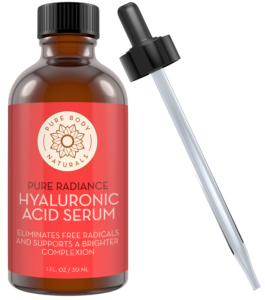 Hyaluronic acid combines with the powers of Vitamin C in this serum, moisturizing skin and defying age. This supercharged serum helps firm and hydrate dry and dull skin, and its antioxidant properties can reduce the appearance skin damage caused by the sun, pollution and cigarette smoke. Vitamin C hyaluronic acid for face and for eyes is a perfect travel-size, pre-moisturizer solution for your skincare regimen. Hyaluronic acid is a lubricating, clear substance that’s produced by the body naturally. In the human body, hyaluronic acid is found in the greatest concentrations in the skin, inside joints, within the eye sockets and in other tissues where it helps retain collagen, increase moisture, and provide elasticity and flexibility. The biggest advantage that hyaluronic acid has to offer is that it has a very high capacity for retaining water, whether on the skin, in the eyes or within soft tissue. IT can help naturally reduce signs of aging by decreasing “epidermis water loss” associated with sun exposure, skin dryness or flakiness. Apply a small amount with fingertips to freshly cleansed and toned face, neck, and decollete areas (avoid direct contact with eyes). Allow time to absorb prior to applying a moisturizer. For optimal results, apply after Pure Body Naturals Vitamin C Serum.